My older daughter, now 16, was nearly five when she drew this family portrait. Her little sister was about month old at the time, and apparently the baby was a huge presence in the household. (See the big green one with three toes on each foot? That’s the baby. A child psychologist could have a field day with this set!) She drew herself as the small one to the lower right, looking like she’s about to make a break for it. I guess there’s always an adjustment period when someone joins the family. 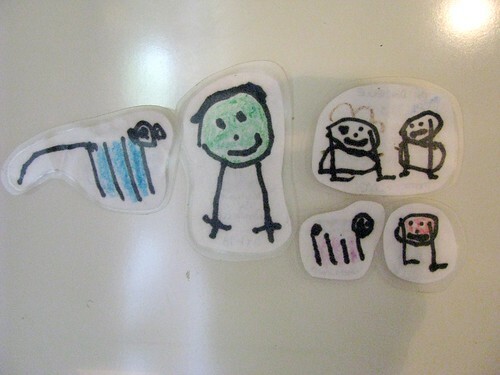 I wish I’d had her draw a new family portrait each month to see how things changed. Oh, the things we think of years later! I wanted to preserve the drawing in some way that also kept it in plain sight and decided to try making some fridge magnets. I cut out the pictures, sandwiched them between two pieces of clear Contact paper and attached an adhesive magnet to the back. I used the type that comes in a roll, but there are nifty sheets of adhesive magnets that would probably work better. I also had her draw pictures of her grandparents, aunts and uncles, made them into magnets and gave them to each as gifts. She was so proud to visit and see her drawings on everyone’s refrigerators! Many are still in use more than a decade later, and the hairstyles STILL make me laugh! I always assumed they were legs, but I really have no clue. I should’ve asked! I like how the cat (to the left) and dog (that’s our old man Sam in his younger days) have no bodies, just floating legs.